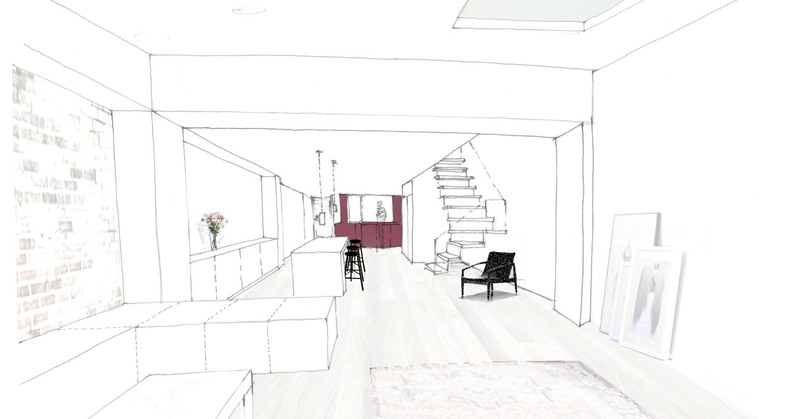 FlowerKittle Architect’s designs for a two storey refurbishment and extension of a flat in Clerkenwell has received permission from Islington Council. Designed for professional sharers living in the city; the spatial layout is drastically modified to provide both functional spaces for the everyday routine, yet looks to improve upon the social aspect of the flat by encouraging interaction between sharers and relaxing spaces to do so. The ground floor has been largely opened up and the stair reconfigured to the heart of the flat. The stair becomes a bright, carefully crafted focus and will be constructed in timber and glass. New joinery within existing niches and recesses offers efficient storage solutions and further maximises the ground floor plan whilst the new glass extension offers further respite and a direct relationship with the large garden.